I am fan of Rajinikanth from the age of 3. I was part of his fan association. If I am here, it is because of him. I have designed my life after him. I have to thank nature and Pa Ranjith for this opportunity to work and travel with him -- as a fan. From a corner of Tamil Nadu to work with him is a huge thing. 80 percent of the shoot has been done in the set. It's amazing that I have gotten the opportunity to design such a massive set for such an important film. This is a dynamic and historical film. Every single person who has worked in the film has been an inspiration. This isn't just a film. It is a voice that will break several disparities in Tamil cinema. I have performed atleast 1000 times, but YMCA has been a dream destination. 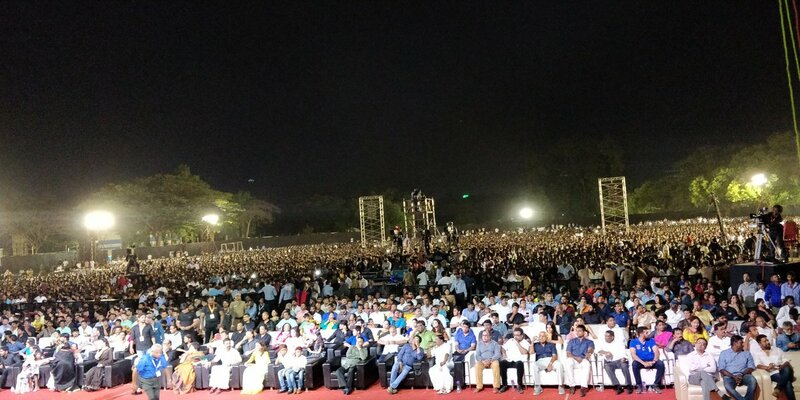 I must thank Dhanush for arranging such a beautiful stage. Every single artist had their names on caravans. It was such a eventful moment for them. Magizhchi. I thank Rajinikanth sir for creating yet another big stage for me. Kabali had received mixed reviews, I was a bit worried. I was clear about conveying what I wanted in the space I was given. Thank you Rajini sir for giving that to me again. The Rajini I have interacted personally is much much more intense, humble and emotional. The power of the real Rajini is mutlifolds than the onscreen Rajini image. I have tried to bring forth that as much as possible. Kaala is a commercial film for sure but it will talk about the people's problems. Rajini sir's voice is powerful. It had to be used for something productive. Especially, that I have gotten a second chance. Dhanush has been an amazing producer. He is one of the major reasons for the project seeing this day. Around 800 people have worked on creating the set per day. I thank all the labour, technicians, supporting cast, cast and crew. We had more than 2000 supporting artists on set. They worked with us for 80 days without any hesitation giving us the maximum cooperation. I must thank Santhosh. I trust him completely. We have a great sync. He gets what I have in mind and creates it exactly musically. Nikkal Nikkal and Poraaduvom were just bit songs but Santhosh's idea was to make it into a massive album. I see this film as a small step in creating an equal space where we respect and treat each other with humanity. The film will talk about the problems of the people. The importance of land and the politics around it. I also thank Soundarya Rajinikanth, who was also a great support for this project. Wunderbar started when Selva and I were talking. It was a time when Selva was struggling to narrate. At that time, we decided that we would support good talent if we are successful in cinema. I am happy to have been able to do that until now, Kaala is our 12th film. Rajini sir doesn't like it if someone praises him. But I would like to share a few things I learnt from him. On the last day a difficult sequence was being shot. There was a delay. I asked him if it was okay. And he says 'This is our everything. There are so many people who haven't gotten opportunity.' I saw the loyality for his profession. Even when the people who had grown due to Rajini sir spoke negative things about him, he always just smiles. I learnt patience from him. 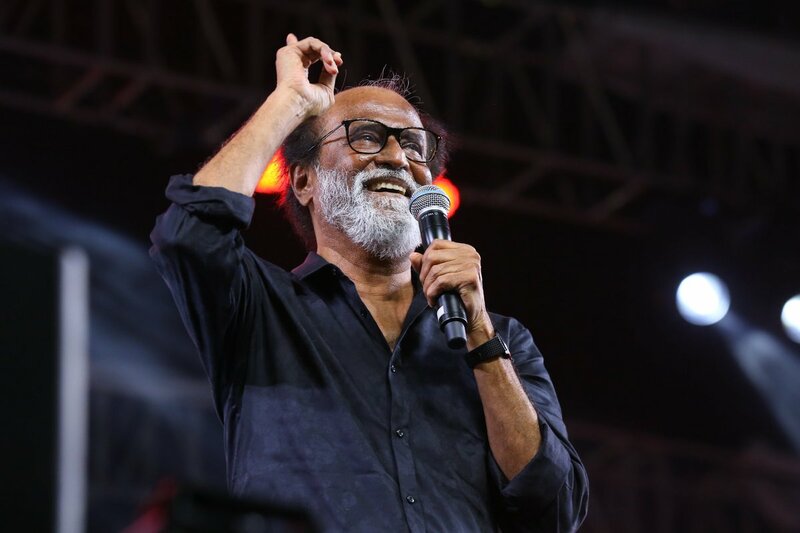 When we decided to invite people for Kaala, I asked Rajini sir, with a tinge of immaturity, if we had to invite people who had spoken ill about us as well. He said 'Everyone are our people'. I learnt the quality of forgiveness. 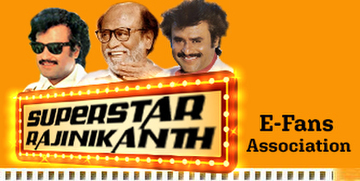 His journey - 'a villain, a hero, a star, a style samrat, Superstar, thalaivar and tomorrow... I am waiting like you to see what happens. This is a film not produced by actor Dhanush, but by Venkatesh Prabhu, the fan. This doesn't feel like an audio launch function. It feels like a film's success meet, and it is one. When we celebrated Sivaji's success, Karunanidhi had graced the occasion and spoke. I was one of the multitudes of people who wanted to hear him talk. I hope and pray we hear his voice soon. We couldn't celebrate Endhiran's success as I was not well. At that time, people told me that if you keep your mind and body healthy, you would heal soon. I don't know anything other than acting. I was doing Kochadaiiyaan then. The proposed budget was too high so I decided to release the film as it is. So that also didn't work well. I realised that I should work with intelligent people, but not with people who are 'too smart'. Then Linga with KS Ravikumar. It was a story I really liked. It was about water scarcity. My only dream has been to unite the south Indian rivers. I would die peacefully if that happens. But that didn't work as well as we expected. Then I realized, one should be good but not too good. Both in real and onscreen. Also, I am 65 years old. I shouldn't be romancing heroines who are half my age. People then told me Rajini is finished. But they have been saying that 40 years now. I have been running with the blessings of God and you all. No matter what negative criticism I get, I will keep doing what I can do. So I decided to adapt to the time and do age-appropriate roles. He didn't come back within the designated time with a script. So when I met him at that time, Ranjith was hesitant. He told me there was something missing and he told me that it was a lifetime opportunity and that if he messes this up, he won't have a career. I realised he wasn't an opportunist and decided he was the director. Later, I got an almost final script from Ranjith. I've never received one script in so many years except for Bloodstone.